August | 2015 | Observations of a tired sOul. Are most academics lonely at work? Last week I announced our new MOOC “How to survive your PhD”. Since then I’ve been overwhelmed by the response, with more than 2600 people signing up in the first week alone, which is far more than I expected! A few people have written to me about how they might use the MOOC to help create a campus based, or online group experience. 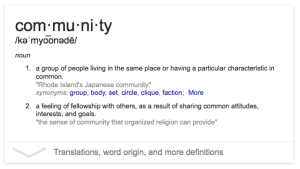 This got me to thinking about how we do – and don’t – create community for and amongst research students. There are clearly benefits from being part of an on campus community. If you listen to PhD students talk you might get the idea that poor supervision is the biggest problem, but survey after survey shows that students everywhere think that universities are doing a poor job of creating a sense of community.